It is inviting entrepreneurs to form small delivery companies employing up to 100 drivers and leasing between 20 and 40 Amazon-emblazoned vans, an initiative that should help it rapidly build out its own delivery network across the country. It is yet another major push by Amazon to gain more control over its own deliveries in a continued quest to build a vast freight and parcel shipping network. Amazon says it has to build out its own services simply to handle the surging number of online orders that UPS, FedEx and the U.S. Postal Service can’t. Amazon.com Inc. is pushing further onto the turf of its shipping partners United Parcel Service Inc. and FedEx Corp. , enabling small businesses to carry its overflowing supply of packages in the all- important last-delivery leg to the consumer’s door. The online retail giant said it is inviting entrepreneurs to form small delivery companies employing up to 100 drivers and leasing between about 20 and 40 Amazon-emblazoned vans, an initiative that should help it rapidly build out its own delivery network across the country. It is yet another major push by Amazon to gain more control over its own deliveries in a continued quest to build a vast freight and parcel shipping network. Amazon says it has to build out its own services simply to handle the surging number of online orders that UPS, FedEx and the U.S. Postal Service can’t. More than $4 of every $10 spent online in the U.S. is on Amazon.com, and the number of its deliveries topped more than a billion last year, according to analyst estimates. Still, Amazon has taken broad steps in recent years to poach some of the most desirable deliveries from its partners and could be on a collision course to one day compete directly with the shipping giants. Amazon expects that hundreds of entrepreneurs could sign up to help the company deliver packages the “last mile,” which is typically the most expensive piece of an online order’s journey. Amazon executives have been working for years on solving the puzzle of how to deliver parcels faster and cheaper than established players, according to people familiar with the matter. The new initiative will give it a visible presence on the streets in bigger metro areas that could help it to start to resemble UPS, FedEx and the Postal Service. While the new service is unlikely to siphon packages from those partners in the immediate future, having even more delivery drivers will allow Amazon to make more of its own deliveries. The number of packages Amazon needs to ship in the U.S. has more than doubled over the past five years to roughly 1.2 billion packages last year, according to estimates by supply-chain consultancy MWPVL International Inc. Projected growth is too much for existing delivery companies to handle, according to the people familiar with the matter. Amazon has advanced deeply into logistics over that same period, building out more than 70 delivery stations, buying more than 7,500 truck trailers, leasing roughly 35 aircraft to fly its wares around the country and expanding into ocean freight. Amazon spent $21.72 billion on shipping world-wide last year, or about 12% of overall revenue. Amazon already delivers some of its own orders in dozens of cities across the U.S. It has planned to launch a delivery service for businesses, dubbed Shipping With Amazon, this year that enables the company to pick up packages from businesses and ship them to consumers, people familiar with the matter said. The service, starting in Los Angeles, could undercut UPS and FedEx on pricing, these people have said. At the same time, Amazon has increased the number of drivers who deliver for the company. It operates a service called “Flex” that empowers a fleet of citizen drivers who use their own cars and typically make faster deliveries. It has also contracted with many small delivery companies to drop off its packages in major metro areas, many in unmarked white vans. But Amazon faces enormous obstacles to build out the infrastructure and personnel to reliable delivery packaging on a broad scale and come close to taking market share from the big players. Amazon would require tens of billions of dollars in investment, analysts say, plus thousands of trucks, hundreds of planes and thousands of sorting centers to handle millions of packages a day. Amazon has faced more uncertainty with its major delivery partners in recent years. In 2013, UPS’s network was overwhelmed with last-minute online purchases at Christmas, causing some deliveries to be delayed and prompting an internal decision at Amazon that it had to build out its own delivery capabilities quickly, according to the people. More recently, President Donald Trump has singled out the company’s use of the Postal Service for its deliveries, criticizing the prices it pays and calling it “their delivery boy.” The administration has ordered an audit of Amazon’s business with the quasigovernmental agency. Amazon hasn’t commented on the backlash. While the Postal Service loses money, its disclosures show that its parcel business with Amazon and other retailers are a net benefit. A decline in first-class mail and other problems are triggering losses. Analysts estimate Amazon ships roughly half of its more than one billion U.S. packages with the Postal Service. Even if rates go up by just $1 a package, it could cost Amazon an estimated $1.8 billion, according to Deutsche Bank analysts. Building out a delivery operation with independently contracted service providers mirrors the strategy used by FedEx to create its home-delivery capability years ago, something it added after its founding as an air express company focused on overnight deliveries. UPS has a combined network of unionized drivers who are direct employees, as does the Postal Service. 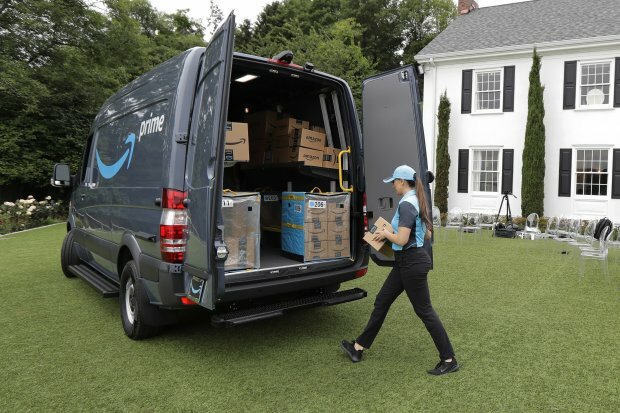 On Wednesday, Amazon showed off the new gray-and-blue delivery van and uniform in its hometown of Seattle, driving the vehicle out onto a grassy lawn with a backdrop of the skyline and Mount Rainier. Mr. Clark compared the new push to build out its delivery fleet to Amazon’s marketplace, where independent merchants now sell more than half of all units on the retail giant’s site. The new companies will be driving to Amazon delivery stations each day for a guaranteed base of packages to take out for delivery.